There are lots of reasons why people change to vegetarian or vegan cooking. It could be due to health, economical reasons, animal welfare or religious reasons. Whatever the motive, if you have been an avid meat eater, it can be a bit of a daunting proposition. Hopefully this vegetarian starter kit will help you get over the initial hurdle – the thought of what to eat. If you are already having one or two vegetarian meals a week then you are well on your way. If you don’t then the advise is – take it slowly. Deciding to start this style of cooking is a fun and healthy way to explore new foods with the added bonus of it being delicious and tasty. A vegetarian meal can be as simple as baked beans on wholemeal toast or a good hearty soup to a more exotic meal such as borlotti bean moussaka. Or roasted vegetable lasagna. Vegetarian cooking is neither easier nor more difficult to prepare than a meat meal. Probably the hardest part is choosing what to serve for dinner as the variety of meals is unlimited. Here is a quick vegetarian starter kit that will help you to begin. 1. There are a few basic ingredients that you will need in your pantry and fridge. Along with a good supply of fresh fruit and vegetables all these foods contain a good source of proteins, fiber, minerals and vitamins. Herbs are best if they are fresh, but it is always good to have the dried version on hand. 2. Now take a look at what meals you are already cooking where you could change the meat part. For example you may be having burritos using mince, so try using a can of refried beans instead. If you have meat patties, try making chickpea patties instead. Instead of a piece of chicken, try having a stuffed baked potato in which you can add a variety of vegetables, beans or corn sprinkled with a little cheese and grilled before serving with the normal vegetables or salad you would usually have. 3. You will now need to get more vegetarian recipes – there are so many to choose from. If you are serious, then treat yourself to a really good vegetarian cookbook – one that explains about the food pyramid, the combinations of foods and their nutritious value (as well as mouth watering recipes). An essential appliance is a kitchen food processor - you will find that you will do so much with it. The other thing you can think about is to grow your own vegetables which will keep you in good supply of fresh ingredients. Even a small area or in pots you can successfully begin to grow your own vegetables. One last tip. If you have a vegetarian friend, go and have a cooking lesson with him/her especially with foods you think you may not like such as tofu. You will not only be surprised but will have fun and see that it really is quite easy. With this simple vegetarian starter kit you can begin your vegetarian cooking. So let's start your vegetarian journey with a basic, simple recipe. You can find more recipes here. The Recipe: Chickpea & Lentil Patties. 1/2 cup chickpeas and 1/2 cup of lentils. Put each of these into a seperate bowl, cover well with water and soak over night. Rinse well. Put into seperate pots, bring to the boil and simmer gently until soft. Tip: You can prepare a couple of cups and once cooked and cold, drain and freeze what you don't wish to use. Place 1/2 cup of cooked chickpeas and 1/2 cup of cooked lentils into the food processor. Add 1 tsp of minced garlic and 1 tsp of your favorite seasoning. Process until all ingredients are blended. If the mixture is too runny, then add about 1 tblsp of plain white flour. Using a dessert spoonful, shape into patties. Fry in a little oil until golden - turning once. These are lovely served with garden vegetables or fresh green salad. Put a little sour cream or avocado on top. Quick and easy and a good one to start with. 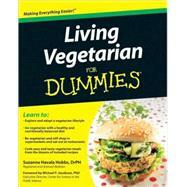 This is the easiest of the vegetarian recipe books that you can get. Includes helpful advice as well as wonderful recipes.